This interactive presentation contains the latest oil & gas production data from 11047 selected horizontal wells in the Permian (Texas & New Mexico) that started producing since 2009/2010, through March 2017. 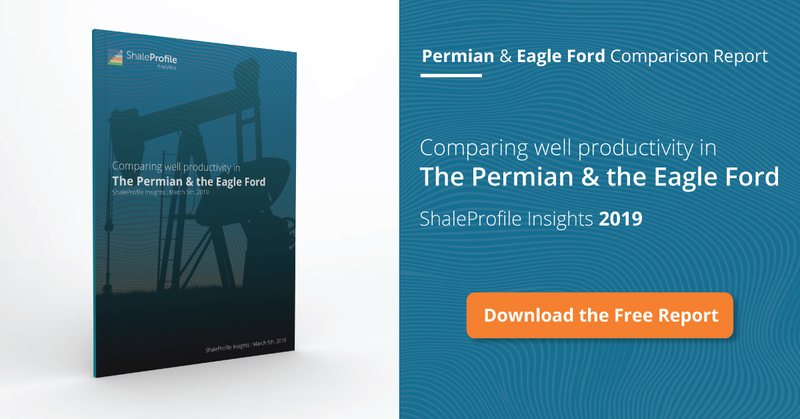 Output in the Permian from horizontal wells has kept on rising in the past two years, and has overtaken production from the Eagle Ford and the Bakken. Production data for new wells in Texas for the 1st quarter is still very incomplete, and therefore I expect that after revisions we will see that this growth has continued strongly in the 1st quarter of 2017 as well. Also in this basin the length of the horizontal laterals, and the proppant volumes used to break the formation open, have increased significantly over the past 5 years. In New Mexico, the average length of these laterals increased with roughly 20%, from 4.5k feet in 2011, to more than a mile recently. In the Texas portion of the Permian, the increase was even larger, starting with a similar length, but now topping 7k feet on average. Over the same period, proppant volumes grew fourfold, and are now on average 11 million pound in New Mexico, and 14 million pound in Texas, or about 2000 pound per lateral feet. As usual, in the “Well quality” tab we can see the effect of these changes in well design. Initial productivity is higher, but production rates also stay elevated for longer, and are approaching a similar profile as the one for Bakken wells. In the “Well status” tab, the incompleteness of the data is demonstrated again by the apparent drop in completions in the first quarter. The last tab (“Top operators”) shows the performance and location of the largest operators. The 5 largest operators have all grown output in recent months. Next week I will have a post on all covered US states again. Texas RRC. I’ve estimated individual well production from well status & lease production data, as these are otherwise not provided. Because of these estimations, I recommend looking at larger samples (>50 wells) before drawing conclusions. About 7% of the horizontal Permian wells in Texas are excluded, as these were mixed with too many vertical wells on a lease, making reasonable well profile estimations impossible. I’ve no spud, DUC, or plugging information on wells in Texas, so these statuses are unavailable. Detailed location data is available for all New Mexico wells, and for almost 99% of the Texan wells displayed; the remaining wells are shown near the center of the county in which they are located. Formation data in Texas is only available on lease level; therefore in cases where wells on the same lease are drilled in different formations, this information is not accurate. I have no issues on both IE and Firefox. I suspect the issue maybe with your browser settings (traffic has to be allowed to the Tableau servers). I correctly interpreted your data plot — Pioneer down -15% with oil production down fast and GOR up. I’m happy you found the data shown here valuable. I think there are quite some nuggets hidden in the data here, for an expert user like you. Let me know if you have any suggestions that would further help. In the coming month I plan to do some extensive work on Texas. As mentioned before, there are some hz wells on especially the bigger leases that so far are not shown (Pioneer has several of these), and I aim to do something about that. Also, further improvements on the allocation algorithm are planned. I hope that with the early September update on Texas, these new results can be shown. You are right that the more complete data from Permian is more convincing. From the existing data, I see PXD and PE both are not telling the real story. PXD tried to attribute the increase in GOR to old wells, while oil does not drop and gas keeps going up. The truth from your website is that wells from 2011-2014 only contribute to less than 10% oil and 15% gas. The 2% change in company wide GOR must corresponds to a gas increase of over 50MCFPD or more than 10MBOPD oil drop, and it come from 2015-2016 wells — your website shows oil dropped for these 2 years at PXD. PE tried to attribute the increase in GOR to 2017 Wolfcamp C well, while oil and gas keeps going up. Similar truth could be found here like his father PXD — 2015-2016 wells are the real GOR raises. thanks for the compliments, Enno, I have to say your wonderful site keeps people coming to seek the simple truth! Here, I have more observations from your latest Permian page. 1. Pioneer’s increased GOR (they show and blame it to all wells increased GOR, page 8 of their latest PPT) is much higher than their initial plan. This sudden increase most likely did not come from the their older wells than 2014 since the total production there is already limited. We should look closely at their 2015, 16 and 17 wells. From your March 2017 data (this page) on Pioneer’s GOR, there is a sudden spike in GOR for 2016 wells, and this might be clearer than anything else in pinpoint the cause of sudden increase in GOR is from the latest 2016 wells. Pioneer’s following page (page 9) is also showing confusing stuff and Enno’s website is — obvious huge spike in 2016. While 2015 and 2017 wells are not showing sudden spikes, we should keep a close eye on them. Generally, the earlier phase the wells show spike in GOR is very scary, and reminds us of Sandridge and Misslime in OK. While in Miss Lime, it is probably spike in GOR after 1-3 months of production accompanied by spike in water cu; this appearance of sudden spike for 1 year old wells for Pioneer is definitively an ominous sign. BTW, Chesapeake also just reported high water cut in their exploration in the northern part of STACK is stopping their STACK work, meaning low water cut of Miss Lime or real STACK stops in Kingfisher/Blaine, no further north. 2. In the water cut plot, Pioneer does not have the data, and so no simple fact could be told. But, the reason for Pioneer to slow down their drilling is because they are experiencing unexpected high pressure in the formation above payzone where they are injecting amount of produced water, and they have to use extra string in drilling. The injection amount must not be small so it caused the delay and a 10% increase in cost. Pioneer already spend over 1 billion dollars improving water supply and disposal network, hoping to save $800~900K a well, and now all that savings are gone. Even if they stop disposing water in the upper formation, the pressure probably won’t go away easily, meaning the 10% increase in per well drilling is there to stay. While, drilling new disposal wells deeper than payzone might cause earthquake, and more risky part is the fear of adding water to the already potentially nontrivial produced water in the payzone.